Crazy to think that we lived our dream....We lived in Squamish, which resides at the foot of Mt. Garibaldi and is in the middle of the Coast Mountain Range. 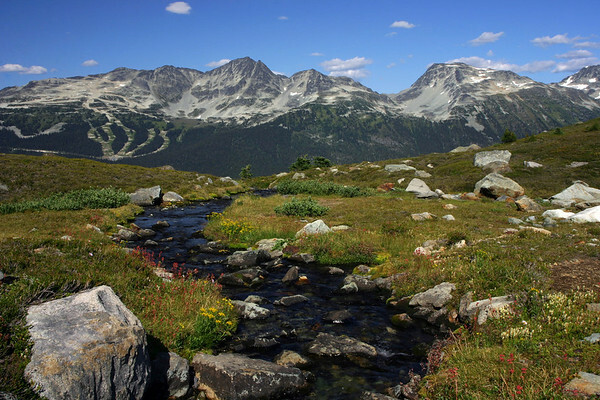 Squamish is about 40 minutes South of Whistler and an hours drive North of Vancouver. I commuted into the city every day for work, and retreated to the mountains every night. We spent much of our free time enjoying the outdoor recreation capital of Canada (or watching movies if it's rainy) while we lived there. Squamish was great to us during the 3 years we lived there, but in Jan 08, we decided on a new adventure and moved into the heart of downtown Vancouver. Fall color at Rohr Lake. Didn't quite realize it when we embarked on this hike with 2 dogs, and 3 kids...but this is quite the hike. Although it's only a mile or two, the last half has no trail. We ended up hiking the hillside in the mud to get up to the ridge line. Quite an adventure with a 9 yr old, 2 yr old, and 9 month old baby. Still a great trip though, and we were fortunate to have another beautiful BC lake all to ourselves for the afternoon. After the hike, we stopped in Pemberton at Pamela's Cook shack for some beer and dinner. One of our best dinners/settings since moving to BC. Can't wait to head back again next Summer. We spent the day out on Green Lake just North of Whistler. 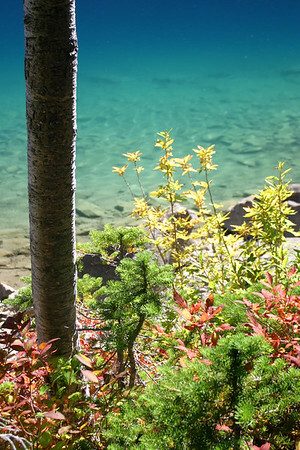 The lake is glacier fed, which creates this tranquil green color. Although the guide books say it's too cold to swim, we jumped in since it was a very hot 28°. 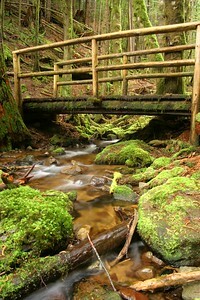 It's places like this that make us love Squamish. This is the Ray Peters trail and it's all of a 5 minute drive from our house. Taken on July 5th, 2006....my 31st birthday. Over the past 3 years, Oneea and I have started a tradition of birthday hikes. On my 29th birthday, we hiked Mt. Sherman (a 14er in Colorado). On my 30th birthday, we backpacked into the Eagle Cap wilderness. On my 31st, I managed to escape work for a day and we headed up to this amazing spot. 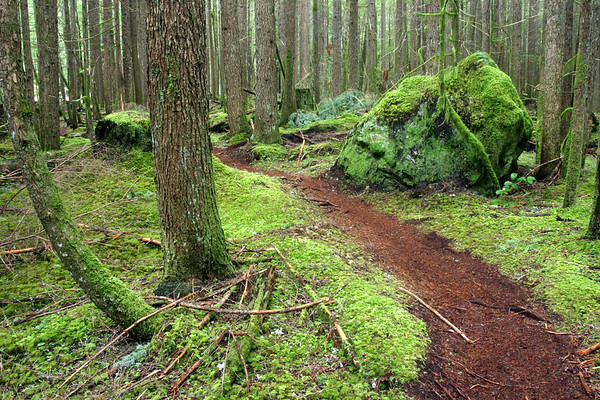 The trail is 14km roundtrip and requires lots of elevation gain, but is well worth the effort. We spent 2 hours lounging around the lake, had a nice picnic and then made the long descent back to the car. We'd like to get back here and spend a weekend camping before the summer is over. Probably the most scenic place we've visited in our 18 months in BC so far. One of many waterfalls along Squamish Valley Road. 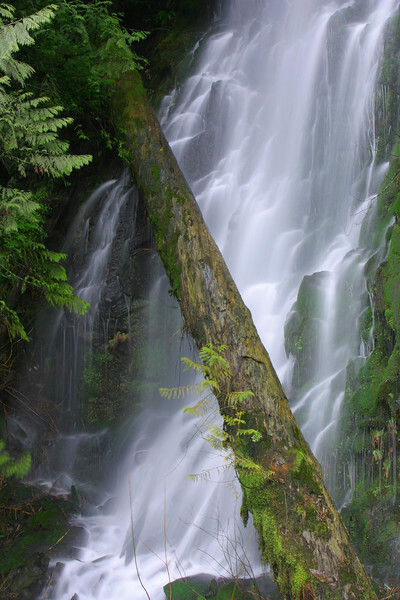 Amazing that such a wonder is only a 20 minute drive from our house. Looking down from the Taylor Peak subsummit at Upper Joffre Lake, and what we called Upper Upper Joffre (the dark blue lake in the lower left). 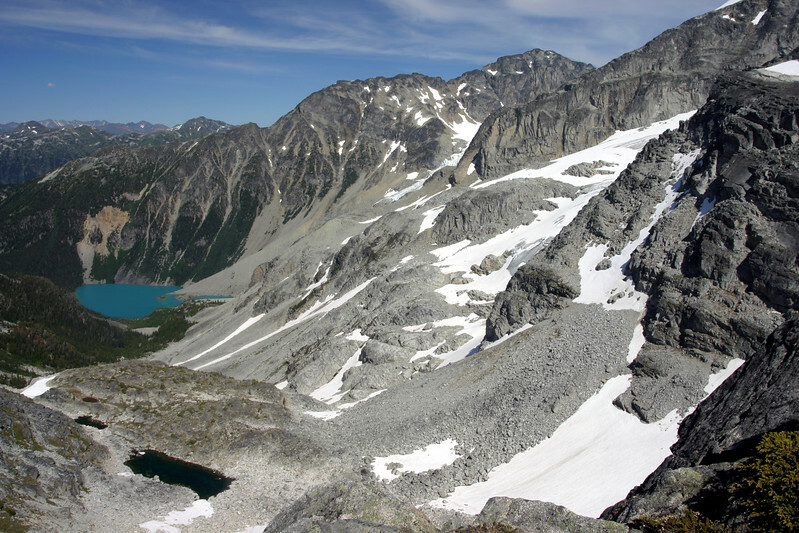 Cheakamus Lake from the summit of Flute Peak. 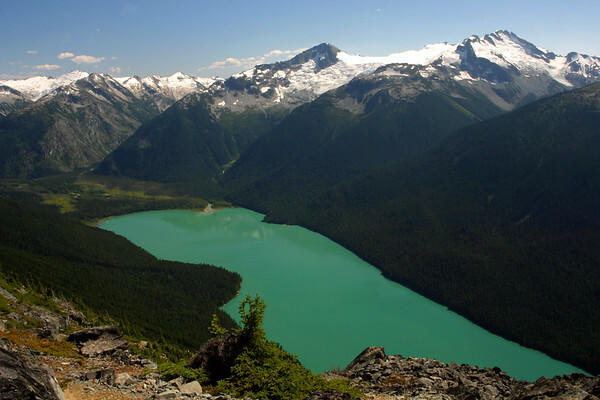 We didn't realize that one of the biggest payoffs of a hike up Flute Peak was the amazing view of Cheakamus Lake. Believe it or not, there is no editing done to this picture. 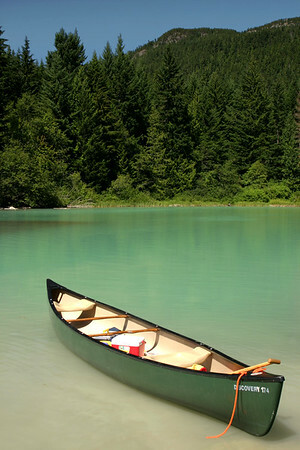 The water really is this color...This is why BC's tourism slogan starts with "Supernatural". A very worthwhile day trip that starts on the Whistler gondola, continues on the Peak Chair to the summit of Whistler Peak. From there, it's an hour or two hike over the Musical Bumps to the summit of Flute. This was Niko's first major BC summit. Looking back at the Tantalus Mountain Range from Garibaldi Provincial Park. 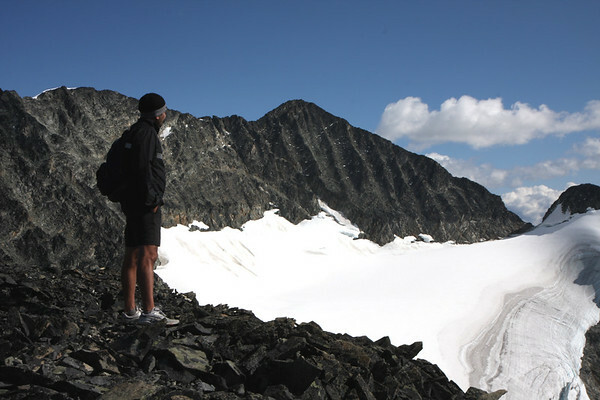 On this day, we were headed up the trail to Panorama Ridge for one of the best views in Southwestern BC. Neel getting in some final thoughts before the climb down. He reflected on many things I'm sure....how much he enjoyed throwing rocks...how much he hated those freaking fake granola bars...how neat it sounded when he'd yell "Hi" and it would echo. 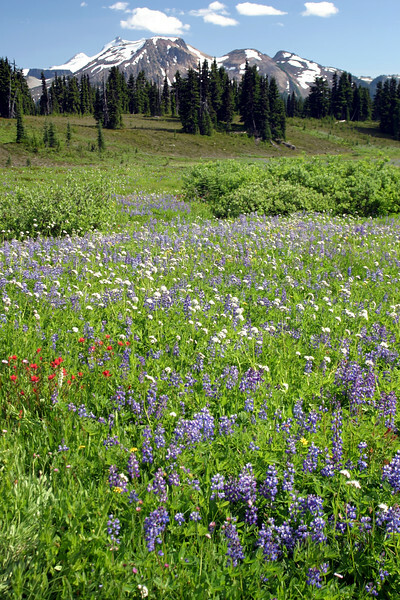 A carpet of August wildflowers in Garibaldi Provincial Park. Sometimes, natural beauty can stop you right in your tracks. 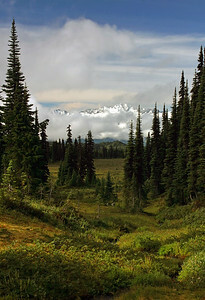 We were hiking along the trail towards Panorama Ridge when we stumbled across this meadow. At the beginning of the day, we contemplated hiking up Mt. Cook (mountain in the top right of this picture) after getting to the lake. After reaching the lake, we decided that we'd had enough of the straight up hiking, and decided instead to go check out the glacier up close and personal. Edith Creek in Alice Lake Provincial Park. This spot is about 6 km from our house in Squamish, BC. The Four Lakes trail is a great day hike with the family. 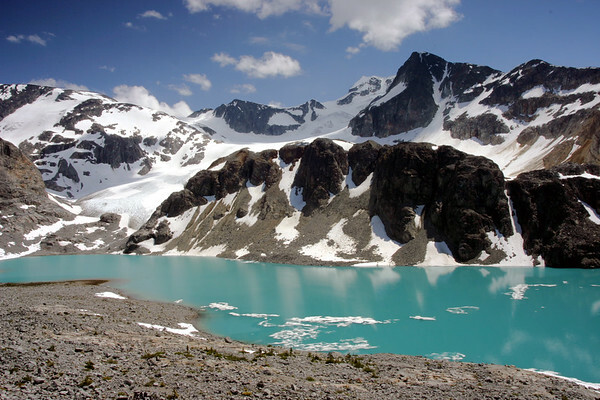 Upper Joffre Lake in front of Slalok Mountain. 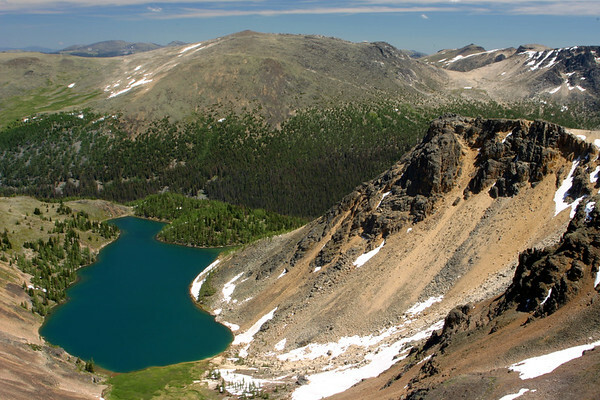 This lake is ~5.5 km from the trailhead and can be reached within several hours of moderate hiking. 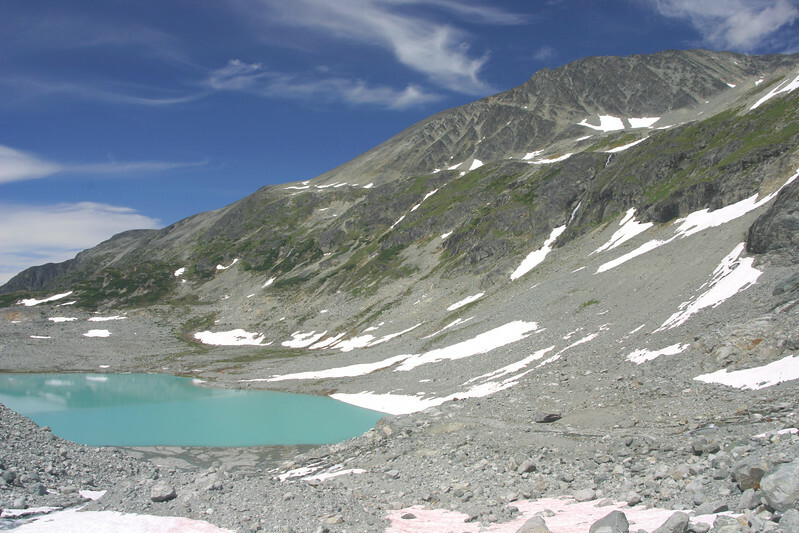 A camping spot is located at the South end of the lake, just below Matier Glacier. 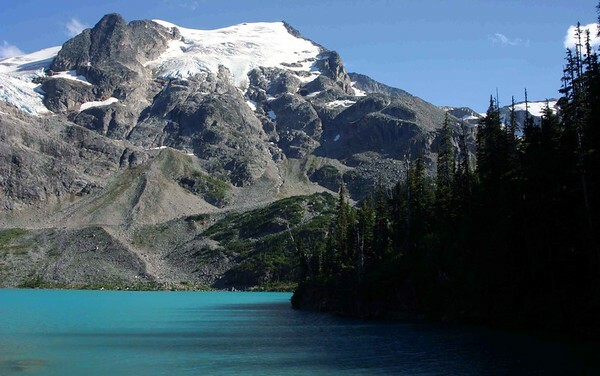 This lake can thank its brilliant blue-turqouise color to the light filtering effect of rock flour (a powdery substance that the glaciers grind off the mountain rocks) in the glacial runoff. The rock flour suspended in the water filters out much of the light spectrum, leaving this remarkable turquoise blue color.